This short reader offers exposure to Caesar, Catullus, Cicero, Horace, Ovid, and Vergil as well as the baroque-era poets Lieven De Meyere and Mathias Casimir Sarbiewski. Ample notes and vocabulary aids assist students reading these unadapted Latin passages. Incorporate this reader near the end of your grammar lessons to accustom students to reading a variety of unadapted Latin authors and genres, use it to fill those last 3 to 4 weeks of the semester after finishing Latin 2, or use it as an enrichment text for Latin 3. Collaboratively compiled and deftly edited by Latin scholars Helena Dettmer and LeaAnn A. Osburn, Latin For The New Millennium: Latin 3 - Select Latin Enrichment Readings is a 160 page compendium of supplemental readings drawn from the works of Roman authors ranging from Caesar, Catullus, and Cicero, to Horace, Ovid, and Vergil. Also included are readings drawn from baroque-era poets Lieven De Meyere and Mathias Casimir Sarbiewski. 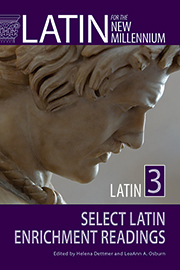 Enhanced with 'same page' notes, vocabulary aids, appendices on meter and rhetorical terms, as well as an extensive Latin to English glossary, Latin For The New Millennium: Latin 3 is a strongly recommended curriculum supplement for Latin language studies programs.